It's done! I have just got back from the framer's and it does look good if I do say so myself! I thought I'd drop by with a new pic of this handsome young man. Was hoping that I'd finish him this week, but that just isn't going to happen. The bottom part is just crazy confetti. I'm glad that this week is the freebie SAL so I'll have a break for a bit. Next up for me is Fragile Heart. Everyone's stitching here is fabulous! Just wanted to take the time to thank all of you talented peeps (members and buddies) that post your stunning work here frequently. You guys are the greatest! Hope this works. Having to use the work computer which doesn't work like my home computer. 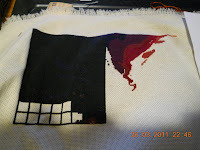 I haven't been able to stitch much as we have been trying to move. Here's what I have so far. 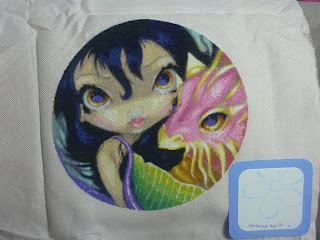 Here’s the first update on the progress of my new start TT A Pale Comparison by Jasmine Becket-Griffith. 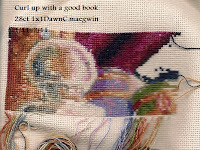 I’ve finished the two partial pages on the right hand side of the design and only have two full pages to stitch. I think that if I can do my usual page a week then I could in theory have this piece finished in a fortnight which will be cool! As you can see she already has some lips and nose and I can tell already that she is going to be so very cute! You'll have to excuse the grid lines and the hoop marks but I'm going to crack straight on with the next page so I'm not going to wash the lines out until she's finished this time round. This is my first post as a full member and it's an important post for me. She's TT (Tiny Treasure) A Pale Comparison by the wonderful Jasmine Becket-Griffith. She's only a small design, two full pages and two tiny partial pages (only 5 stitches across) so I'm going to stitch the two partial pages and then go back to Faerie Melody. I guess I just wanted to be able to say I'd started her!! I have had her kitted up for some time now after all! As soon as there is something worth photographing then I'll post you a WIP! 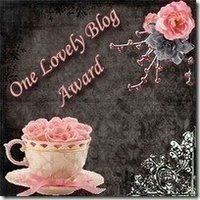 My blog has also had a revamp if you want to pop along and have a look! I got the flu this Thursday and for the sake of myself and my coworkers stayed home from work. Of course this meant stitchy goodness. However, I was in such a condition that my mother drove up to take care of me for a few days. 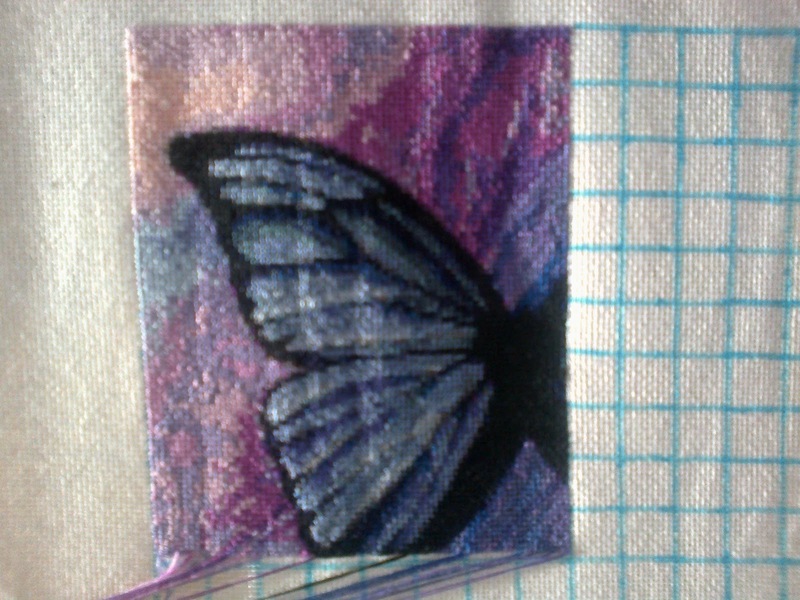 As "College" is being stitched for my parents as a surprise, I hid it away and worked on a non-HAED piece for a bit. I did get something done on "College" though, just not as much as I thought I would (totally worth it for mommy care and chicken noodle soup from scratch, I'm such a pansy when I'm sick). On another note, I've decided to restart Dark Queen. I realized that I wasn't enjoying stitching her. I originally started her as 2 over 1 on 25 count, which made it really difficult to pull the needle through. It was more frustration than pleasure, so she will get a restart. Thanks for reading, and thank you for all the kind comments. Yeah! I'm now a full fledged posting member! 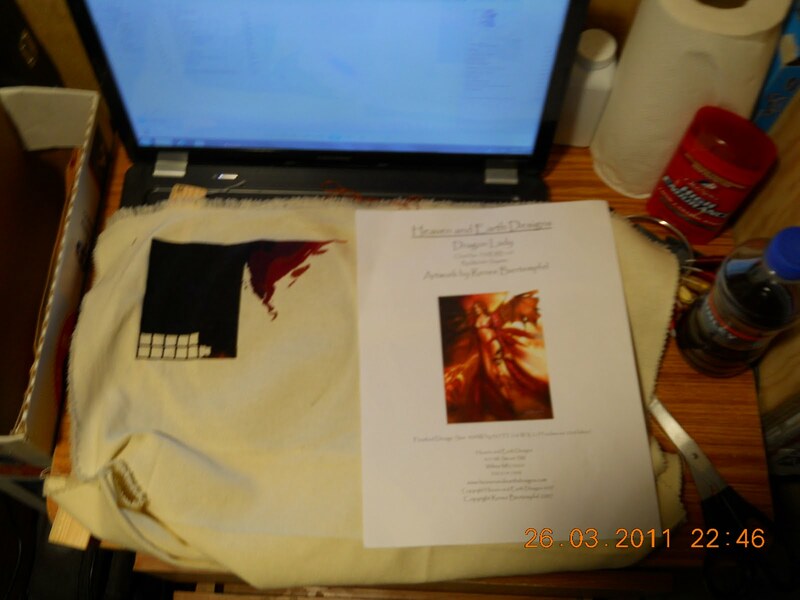 This is my progress on the Dragon Stocking as of March 27, 2011. You can start to really make out the details in this design (see the dragon's tail!!!?). The part I'm working on now is the treasure chest. I had to start rolling up the threads for each set of 10 x 10 stitches because I found that, when they hang down off the back, I tend to catch them in another stitch. I have a custom made floor stand, so all I have to do is flip the frame over when I need to finish off a thread. No knobs to loosen or anything like that. 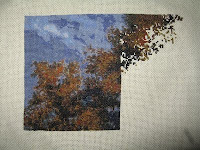 As soon as I finish this set of 10 rows, I'll post another progress picture. I have put in 2 weeks on The Astronomer & I think I have made some good progress. I did 926 stitches. It doesn't sound like alot but it was all confetti stitching. I confess I had one day out of the 2 weeks that I did not get 1 stitch in. Just too tired. Now I have a confession to make. Chocolate, Chocolate & More Chocolate was supposed to have a turn next but I could not resist starting another one. I have now added Afternoon Tea to my rotation. What can I say. I'm addicted to these little dragons. On a non stitching note the weather here has been better. No snow & not much rain for the last 2 weeks.Maybe spring has finally come to New England. Okay now time to go stitch somemore. Here’s the latest page finish on Faces Of Faery 141 now that page 4 is done! Alice now had a pretty little eye and is looking so gorgeous, time for her to go away for a little while so I can work on Faerie Melody again! See you soon with a Faerie Melody update hopefully! First of all, thanks for your warm welcome. It's great to be here! 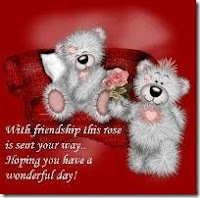 And thanks again to Laura for being my buddy. A little update on my dear Blue bird. It starts to show a little bit now. I'm so happy that I want to share it with you. it's a real feast of colors! I love it. Stitched on 28 ct, one over one, full crosses. And this is my new start, The wizard of oz. i've started from the bottom right. i wanted to see that part, as other ladies are doing wonderful work on the left side. I've tried tent stitching for this one. Stitched on 28 ct, two over one, tent. Labels: I started it in July 2010. Now it's finished and ready to frame. I'm very very happy. Started page 2. I got bored with the black and starting making boxes and other stuff to make it more interesting on page 1, and then I ran out of black. If I were not sitting in the middle of Afghanistan I would have went out and gotten some more black and finished page 1 before moving on, but instead I have to wait for my wife to mail it to me (its on the way) so I figured I would just keep on going. The last page of this month. Of course I had to work on 25 and 26 March at the Christmas stocking. Still four days in March for the Medusa. But it is to good weather to sit inside. Then I just start again tomorrow night at The First Rose. Beautiful green is not ugly. Hello everyone, once again thank you to the lovely Susan for posting my update for me, she's a very generous lady - she does my updates for me and puts up with my blathering emails as well. Anyway, this is my first update on Dragon Rider, which I've been working on for a couple of weeks now, and I'm quite proud of how much I've actually managed. I know that my progress is pretty slow compared to some people on here (GIzzimomo springs to mind) but for me, this is a massive amount of stitching in two weeks, achieved by a weekend to myself and a week off work. 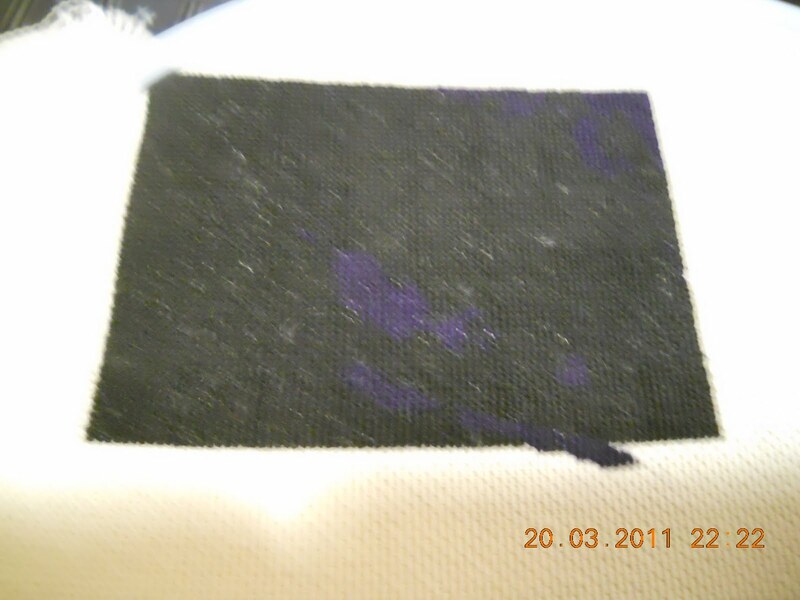 I know it doesn't look like much yet, but it will do one day, I have confidence, and in the mean time it does feel like it's stitching up quite quickly, mainly becuase there's loads of black which is just fillling in the gaps. Once again, I love seeing everyone's progress, keep up the beautiful stitching. Stitching 1 over 1, full crosses on 25 count evenweave. Happy Stitching All! Keep up the Great Work! Your friendly Admin here with a request. 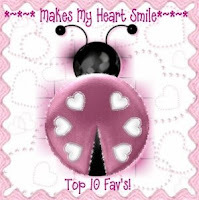 First, I want to thank you all for posting your fantastic work! It's all so stunning! I don't always get the chance to comment, but I do read/keep up with all the posts and I am always just knocked out by all the talented people here. Next, I'm putting out the call for buddies again. Our membership is full, and we already have many members that have paired up with more than one buddy (thank you to those of you that have a buddy or more than one buddy). If you are a full posting member and you haven't joined up with a buddy yet, would you please consider it? I have current requests, and I would hate to have to turn anyone away. If you're interested in taking on a buddy please email me. Stitched 2x1 on 25ct Lugana, with tent stitches. 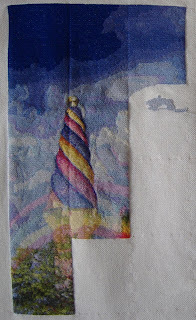 After my short break I've gone back to work on both wips with full speed, as a result, on Unicorn Dreams part of the castle's entrance showed up next to the butterflies. Since every 6 days I get a day off I thought that would be the time to send in an update. 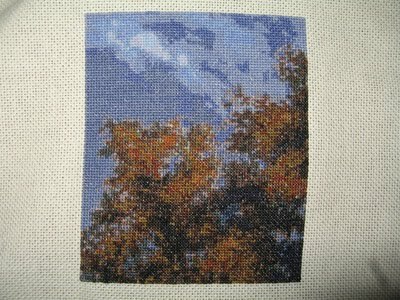 I am 4800 stitches into this. I am pretty tired of black I assure you! 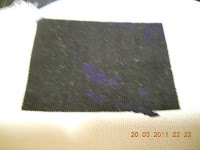 Thankfully some there is a little dark navy blue mixed in for some variation. I am just over half done with the first page and I am looking forward to more colors on the next page. Another page on Terra is done so I can put her away for another month or so. I found her much easier to stitch on this time round, I don’t know if it’s because I finally got my head around the tenting or if it’s simply because there is more of her to see now and the colours are now brighter but either way she is now definitely going to get finished and not become a UFO or a restart so that’s a relief I guess. I’m back with Faces Of Faery 141 now for the time being so there will be another update VERY soon! 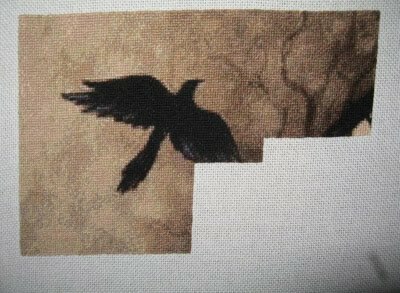 pictures progress. They're absolutely gorgeous. about halfway through page 2 - a total of 11,990 stitches done so far. that is since, apart from the sky, it's basically all confetti. Currently I have one full page done. able to be a part of the SAL. I have Finally Finished Pg 11,12 and Started Pg 13 of "Envy"
It felt so good to finish that bottom row! The Pictures really dont do it Justice. All the Greens Look Fantastic together. Everyones work is looking Fantastic! 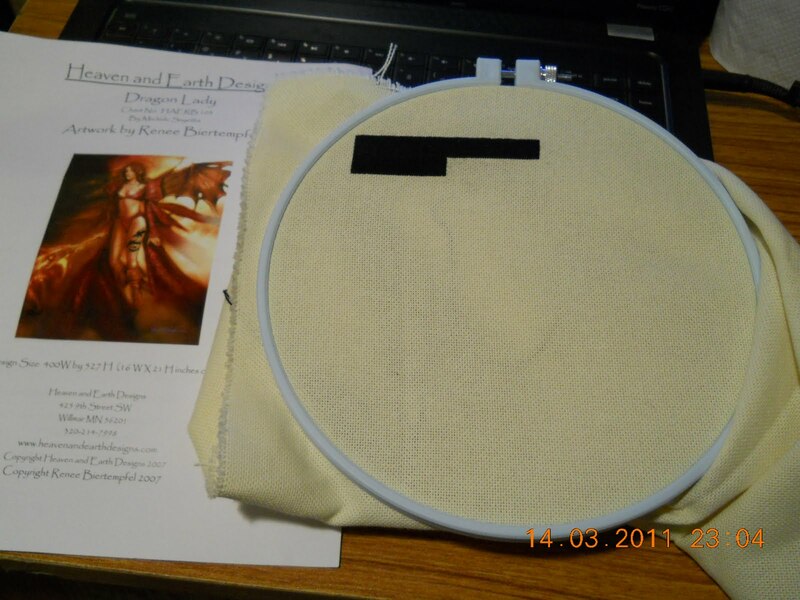 Labels: Envy, Manbroider, QS "Sweet Selena"
I started her on 2 December 2010 and finished her on 16 March 2011. She is stitched one over one, whole crosses on 28ct bone jobelan. I love the way she has turned out :-) Thanks to Michele's great charting! On now to finally being able to join in the 2011 SAL with Curl Up, and to my new start - Early Visit by Tallamy. Thanks to my buddy Laura, I can join your stitching blog. My name is Anojaa, I'm 33, french girl with sri lankan roots. I'm stitching on and off since the age of 10. And this is my first HAED. First of all, I want to thank all of you : your blog is great and your stitching fantastic. From some time I was yearning for an HAED. But I thought it wasn't for me, I wasn't sure of the outcome, etc. So thanks to you, I've started one and I'm extremely glad I did (well, most of the time, when I'm not struggling with my confettis stitches). I've chosen Blue Bird of Josephine Wall. Not an easy start but I couldn't resist the beautiful colours. 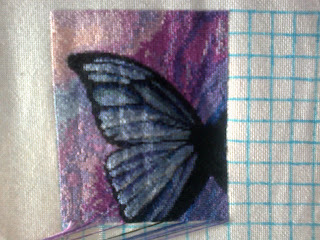 Sorry you can't see much (just a tiny little bit of the wing, if you look very carefully). I hope next time i can show you more. I'm stitching on 28count Jobelan, one over one, bottom to top of the first page. I should have started at the bottom but I want to see the top first, so now, I can just hope that no dividing line will appear. Hello from Afghanistan! Well today was my first day off since leaving the US at the end of October and I started my project. 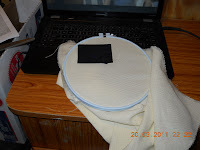 I managed to complete the first 1200 stitches. I don't know if thats alot but I thought it was a good start. 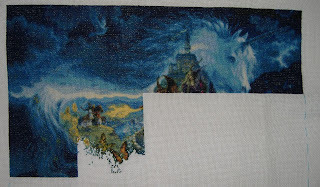 I am stiching this on 25 count evenweave. 1 x 1 with 2 threads. I thought about using only 1, but I like the look of 2 strands. This is the first time for me using anything other than 15 or 18 count aida. Hello everyone, thanks again to Susan for kindly posting my latest update. The brown shmush that will eventually look like a window is actually starting to take shape, which I'm very happy about. There are even a couple of areas of solid stitching now, which is cool, although I'm actually debating carrying for the next page, but I'll see how I feel at the time. I've actually just started a second HAED (oops, how did that happen? ), so I've now got two projects to update on. I think that's everything I need to say. 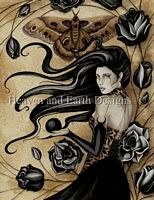 I'm trying to be better about posting updates on my HAED's. I am rotating 4 of them at the moment(that could change if my fabric ever comes in) but I haven't been good about posting updates. Since I am no good at keeping track of how many hours I put in at any one time I keep track of how many stitches I do each day. So far Treasure Quest has had 2 turns in the rotation of 2 weeks each time. The first 2 weeks I put in 2214 stitches & the second two weeks I put in 1639. The 2nd rotation had alot more confetti stitching. Now I have put this away and am working on the Astronomer(the HAED that started my addiction) for the next 2 weeks. I've almost finished my first page (page 15). There was some confetti stitch at the bottom left of the page but I've almost done with it. I was so happy to see part of her eye appearing. It was almost magical !! I will continue with page 14 very soon. I stitch on 25ct evenweave. I've managed to do 4200 stitches so far ! I still have a long way to go ! Well here we are with Emerald Dragon and Page 2 is done! Incidentally Page 3 is also done but only because Page 3 has no stitching on it, so next page with stitching will be Page 4. My little dragon now has a head and neck and looks sooooooo cute! While I was stitching him it looked like just a mass of green and as usual as soon as I stepped back there he was in all his glory and I’m really pleased with how he’s coming out! Well it’s back to Terra for the BB SAL now to do Page 2 on her and get her out of the way. I’m must admit I’m really not looking forward to stitching her again so I guess this is make or break for her as either I won’t be able to bring myself to do the horrible tent stitching anymore and she’ll get permanently benched or I will be able to bear doing it and she’ll make the cut…. time will tell I guess! In one week one page done. Well that's even for me surely hard solid work. 7315 crosses. Next week a bit slower I think. A little more confetti. Top of the page, the third row from the right. It's all her hair. I do not think in this line down her face appears. But that's okay. I'm through the first hard and boring background.